A Blue So Dark is the reason why I love reading so much. 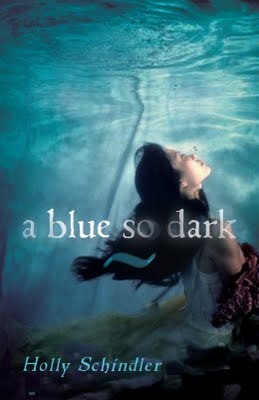 Every once and a while a truly remarkable book makes it into your hands and A Blue So Dark was one of those books for me. Once I finished reading the last sentence I was left a little sad, not at the book but because it was over. Aura is an unforgettable character and her story will stay with me for a very long time. The story is heart-wrenching, tragic and hauntingly beautiful. Aura is just a 15 year old girl that has to deal with problems she shouldn't even have to face. She is her mothers only support system and "caregiver", if that isn't enough she has her own problems to deal with and she begins to feel suffocated. There were so many moments that I wish I could just reach out and hold her hand. Be there for her. Be her support system. The writing style is very poetic, it is filled with heart and soul. It was beautifully written. The book is emotionally charged, you won't be able to sit though this book without feeling something, anger, sadness, whatever emotion arises you will feel it. The intensity of this book is consistent and stays throughout the book, You'll be flying through the pages. This book is not only about a teenage daughter trying to cope with her mothers illness. It is also about love. The love between a mother and daughter and the love between yourself and your passion, the one thing that makes you feel alive. Holly Schindler penned such an beautiful, passionate book. This is one of those books that should be on all bookshelves. A must read! What I disliked: Nothing. Honestly, there isn't one thing I didn't love about this book! Oh, I am so going to read this. :-) Thanks! I've just started this one, and I love it already. I can just tell it's going to be awesome. Great review! I love it when a book makes you feel so deeply. I can tell it did that for you. Great review. I've not heard of this book, but it sounds fantastic. Thanks! I definitely need to read this. It sounds really unique and interesting, and I love the cover. Great review! Though there are many heavy aspects of this novel, there were lighter, brighter parts as well, like Aura's crush on a cute skater boy. This was a huge part of the novel, as expected, her mother's illness occupied much of Aura's time and energy, but I was greatful for the romantic reprieves.